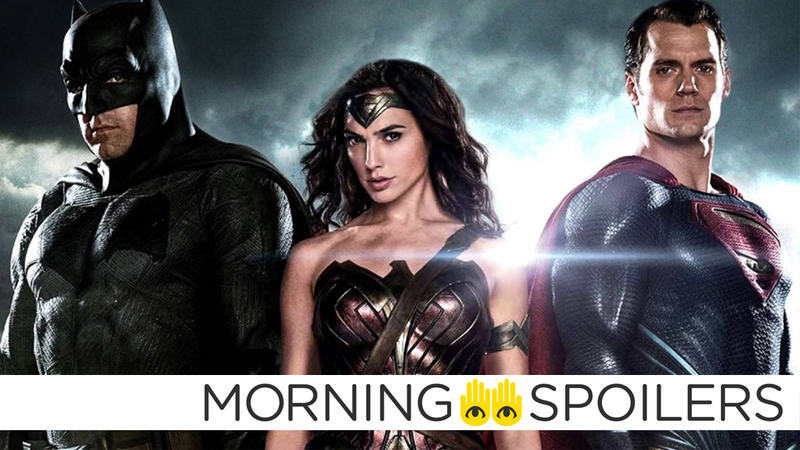 What Mystery Project Are Zack Snyder and Geoff Johns Secretly Planning? Steven Spielberg confirms George Lucas’ involvement with Indiana Jones 5. Karl Urban really wants Dredd 2 to happen. Arrow casts a former Walking Dead star as a new villain. Plus, a Power Rangers teaser poster for a teaser poster, and more Spider-Man Homecoming casting. To me, my Spoilers! Jim Carrey and Eli Roth are teaming up to make an adaptation of the Steve Niles comic book about a slain TV horror host who curses his town . George is going to be an executive producer on it with me. Of course — I would never make an ‘Indiana Jones’ film without George Lucas. That would be insane. Iron Man 3 writer Drew Pearce will make his directorial debut with the movie, a crime/scifi thriller that has drawn comparisons to Ex Machina, Drive, and Looper, according to Variety. That’s another world that I don’t want to walk away from. It’s the first thing I did that I set up to be a possible franchise and Melissa is dying to do it. I have a story for it, and a funny idea that will kick it off that involves Statham. Susan Cooper is one of my favorite characters I’ve ever come up with, but Rick Ford is possibly the one I’ll take to the grave with me. Will he get any more self-aware in the sequel? No, god no. He’ll get less self-aware. A new set picture of Danny McBride with Ridley Scott has been released. Buried in the litany of set reports released yesterday about the production of Justice League, a report from Joblo includes a comment that Snyder is currently working a secret project with Johns that couldn’t be discussed. Naturally, this lead to a flurry of speculation as to what the project is, with guesses ranging from the obvious (Justice League 2), to the slightly more out there (Green Lantern Corps, given Johns’ love of the comics), to the downright unlikely (Snyder’s 300-style take on the American Civil War). But Heroic Hollywood claims that the project isn’t a DC Film, and offers an alternative option: the previously rumored Watchmen HBO show. This would make a good deal of sense, given Snyder’s own cinematic adaptation of the iconic comic, and Johns’ recent major role in bringing the Watchmen characters into the DC Comics universe—but take it more as an educated guess for now. Sarah Polley will star in a Netflix series based on Margaret Atwood’s true crime novel Alias Grace, set in 17th century Ireland.